Kaushik Biswas is a mechanical engineer in the Building Envelope & Urban Systems Research Group at Oak Ridge National Laboratory. 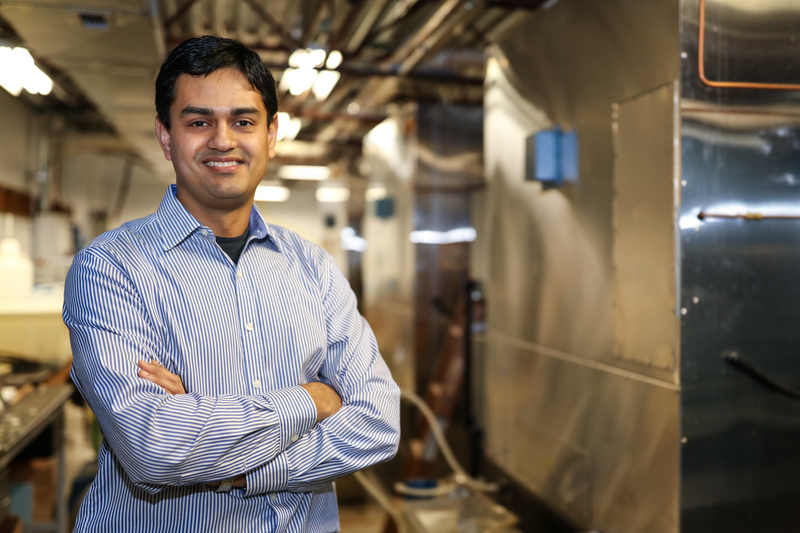 June 6, 2018 – Inspiration often strikes in the unlikeliest of places and for Kaushik Biswas, a mechanical engineer in ORNL’s Building Envelope & Urban Systems Research Group, a moment spent enjoying entertainment led to the idea of developing self-healing vacuum panels for buildings. Fast forward a few years, and Biswas brought the concept to life by creating novel multi-layered barrier films with self-healing properties for vacuum insulation panels (VIPs). This high-tech insulation is five to 10 times better at reducing unintended heat losses and gains through building walls and roofs than conventional materials. The work is a high priority for the Department of Energy’s Building Technologies Office. Some 40% of the nation’s energy is consumed in residential and commercial buildings, according to DOE. Over the past year, Biswas has been working with ORNL Chemical Sciences Division researchers Tomonori Saito and Pengfei Cao to optimize the self-healing chemistry, demonstrating proof of concept through laboratory experiments. “We had some challenges coming up with the correct chemical formulation, but we think we have identified an appropriate combination,” he said. The team conducted experiments to see if small-scale samples could self-heal themselves after penetration—and they did. “We performed a limited number of experiments on 2x2-inch samples and they were successful,” Biswas said. “The next step is to determine how we scale up to something that can actually fit a vacuum panel.” The team expects to complete the scale-up to vacuum panel size in 2018. Combining materials research with heat transfer principles has been a primary focus of Biswas’ work with ORNL. He’s been part of a research team that developed a two-inch-thick composite foam-VIP insulation board that can achieve R25 (unit of thermal resistance), which is more than twice as much as typical insulation used in buildings. He’s also investigating alternative thermal management techniques for buildings; building materials with tailored properties; and energy generation and storage technologies. Biswas’ quest for discovery is rooted in his pre-ORNL work. He grew up in India and came to the U.S. to pursue his master’s and doctoral degrees in mechanical engineering at Purdue University. Biswas has made his home in East Tennessee, with his wife and three-year-old son. His parents still live in India, but his mother has visited several times and so has a close uncle who mentored him as a child.